Giving back to the community is at the heart of Luther North College Prep. 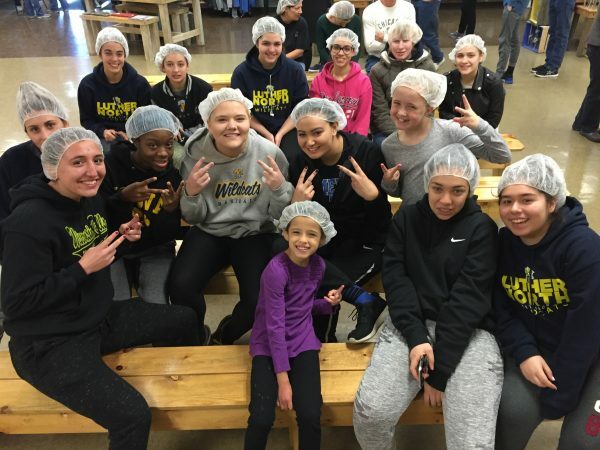 Whether by preparing meals through Feed My Starving Children (featured left) or creating care packages for cancers patients through Phil's Friends, it's important that we show the importance of volunteerism to our students. Prioritizing community service is why we require students to fulfill 10 yearly service (volunteer) hours prior to graduation. Would you like to provide our students with more opportunities to assist our community? We're always looking for new service opportunities for our students to fulfill. If you know of any, please contact us by events@luthernorth.org. "Trust the Lord forever, for the Lord God is an everlasting rock... On this rock, I will build my church."